The Original Stock Market Crash! he South Sea Bubble Playing Cards were first published in London by Thomas Bowles in 1720. 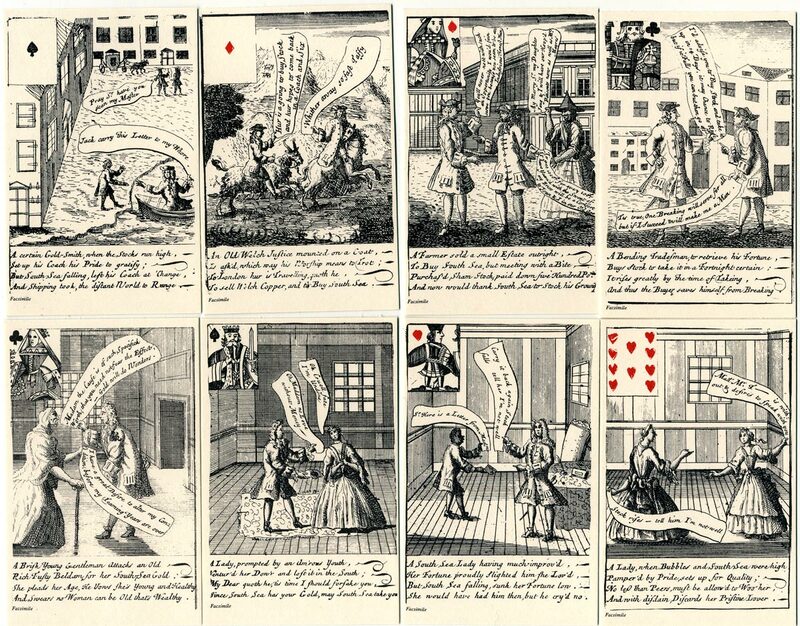 The cards bear satirical portrayals of the speculators involved in various commercial projects started during the South Sea Bubble of 1720, providing a unique contemporary record of the feverish atmosphere of the time, as well as the fashions of dress. The cards were printed from copper plates, with the red suit symbols being applied later by stencil. 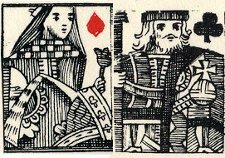 The court cards contain interesting miniature versions of the standard full-length figures used on playing cards at the time. The backs are plain. A modern facsimile of the pack is part of a range published by Harry Margary. Three of Hearts: A Venetian lady, owning a Dutch pack of cards satirising the notorious Bubble schemes of c1720, invited one of the worst financial miscreants to play cards. The first card he turned up was the Three of Hearts and he left immediately, deeply offended.